For the first time, we will be able to accept payment by credit card. There is no need to pay anything in advance. Pictomania is the drawing game with no teams and no waiting. Everyone gets to draw, and everyone gets to guess, all at the same time! No one has time to draw a complex masterpiece. The player who can sketch the essence of a word with a few lines will have more time to figure out the other players' drawings. And more time to laugh at them. Codenames and Codenames: Pictures, the multiple award-winning social games, are becoming an even "bigger"! These double-sized versions are ready to be enjoyed by larger groups, it provides easier visibility with all the fun of the original. This is THE expansion which brings a new character to the game and players of the base game back to the table to enjoy Adrenaline Deathmatch mayhem. It introduces character-specific weapons and abilities bringing new effects to the game. The unique Adrenaline Rush system will boost your epic shot. A new team mode requires effective communication with your team, to combine your abilities, use the position of your opponents to your advantage, and enjoy creating sophisticated strikes! Check out developer notes from Peter. If you would like to have a chance at winning some of these games, get ready for a BGG contest, starting tomorrow, Sep 19th, and running until next Wednesday. P.S. : The demo team is getting ready, the digital team is working on what they will introduce (an unique demo of Through the Ages expansion). The sales team is practicing the most lovely smile ever. 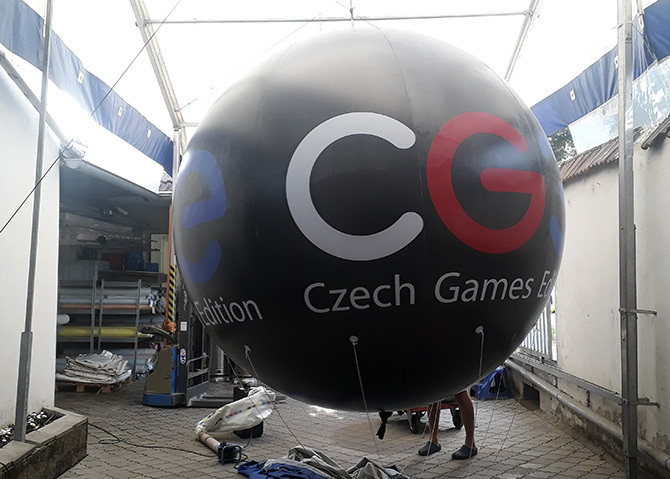 A huge balloon with the CGE logo, that will be floating above our heads, was received today. Hurray!